Objectives: The purpose ofthisstudy wasto investigate the bond strength ofmedicinal biomaterial fiber post with canal wall using different types of cement. Methods: Thirty sound maxillary canines, each canal was prepared using #55 K-file and was obturated according to manufacturer instruction. After that, fiber post was cemented in the canal for each one. Specimens were divided into three groups according to types of the cements that were used for cementation: [(G1:Relay X U200), (G2:RelyX Luting), and G3:(GC lining cement)]. After cementation, all roots were stored at 100% humidity till testing. Each Sample was investigated using pushout test by placed them in a universal testing machine at a crosshead speed of 0.5 mm/min. Results: The highest Bonding strength wasshown in G2 cervical level, while the lowest was shown in G3 in middle level. Results: the highest bond strength was shown in cervical level for all cements type, while the lowest was shown in the middle level. Conclusion: Thehighestbonding strengthwasobservedinRely XU200while the lowest was seen in lining cement G3. G1 has higher bonding strength than Conventional G3 due to micromechanical retention. Dentists were using the medicinal biomaterial cast post and cores for restoring badly destructive endodontic treated teeth. In cases that coronal tooth structure was lost during the root canal therapy using of either direct or indirect restoration is indicated. Now, biocompatible non-metal posts are used as an alternative to casts post because they are nearby to the elastic modulus of dentine, in addition they are more esthetic than metal ones. Therefore, they present higher longevity and high fracture resistance . Furthermore, biomedical fiber posts have several advantages as preserving the root structure by less dentine removal, fiber optic post has higher esthetic due to increase esthetic client demand  and less dental procedure so that less chair time [3,4]. Several studies analyzed the main causes of fiber post’s failure, they have shown that it was because of de-bonding between the post and intra-radicular dentin [5,6]. With the addition bonding strength of cementation is directly faced by C factor which is affected by polymerization shrinkage that creates gaps between cement and dentin, which will lead to reducing bonding strength [7-9]. Researchers showed that de-bonding between post and cement is less than between cement and intra-radicular dentin . The adhesion mechanism of the cementation post to root canal dentin is mostly. Ferrari et al. presented that, when the filler load is increased, the polymerization stress will increase due to decrease in the bonding strength. The tooth/restoration interface can suffer long-term degradation due to the action of water, temperature changes, and mechanical loading [12-14] which lead to failure over time [13,15,16]. On the other hand, using of G1 and resin modified glass ionomer have been used as an alternative to resin based cement [17-19]. Researchers showed that resin-modified glass ionomer cements have stronger bonding when compared to conventional glass ionomer bonding [20,21]. There is a huge controversy between dentists about the proper cement material in fiber post therapy, so that this study tried to investigate the bond strength of biomaterial fiber post with canal wall using different types of cement. Thirty maxillary canine human teeth were endodontically treated using K files (Dentsply, Maillefer, USA). The working lengths were measured by reducing 1 mm from their measures under radiographic image. Canals were prepared till 55 K-file to get standardization. Roots were irrigated using saline then dried with paper points. The roots were obturated with size 55 gutta-percha points (Dentsply, Maillefer, USA) and AH-plus sealer (Dentsply, Detrey of MbH Germany) using the cold lateral compaction technique. Later, they were stored at 37°C for one week to permit the sealers to set. Two third of the root canal length was removed using a gateglidden bur, and next prepared space for the post according to manufacturer instruction (Dentsply, Maillefer, USA). Then canals were irrigated with normal saline to remove debris and remnant of gutta-percha and sealer. Then, the fiber posts were cleaned using 95% ethyl alcohol and dried with air spray. The specimens were randomly divided into three groups (n=10) according to types of the cement used: RelyX U200 (3M ESPE, USA); Luting & Lining Cement (3M, ESPE, USA) and Lining Cement (GC, Japan) (Table 1). RelyX U200 3M ESPE, USA Powder: Glass fillers,silica, calcium hydroxide,Self-cure initiators, pigments, light-cure initiators. Liquid:Methacrylated phosphoric esters, dimethacrylates, acetate, stabilisers, self-curing initiators. RelyX Luting 3M ESPE, USA Pasta A: Fluoroaluminosilicate (FAS) glass,Proprietary reducing agent, HEMA, Water,Opacifying agent. Pasta B: Methacrylated Polycarboxylic acid, BisGMA, HEMA, Water,Potassium persulfate, Zirconia silica filler. Liquid: Distilled water,Polyacrylic acid, 2-Hydroxyethylmethacrylate(HEMA), Urethanedimethacrylate (UDMA). Table 1: Illustrate the luting cements that were used in this study. All cements were used according to the manufacturer’s instructions and placed on the post then inserted in the canal for each tooth. Later excess cement was removed using micro brush. Samples were stored for 10 days in humid environment. Root of each sample was sectioned below the cement-enamel junction, perpendicularly to the long axis using sectioning machine (Isomeet 1000, Buehler, Lake Bluff, USA). Three sectioning with thickness (1 mm) slices were obtained per root at 1 mm, 5 mm, and 9 mm from their cervical portion. Thus, each slice represents different post level in the same root (cervical, medium, and apical). Then, each specimen was attached with acrylate-based adhesive be adapted them in the device, which was carried out on a universal testing machine (EMIC, Curitiba, SC, Brazil). A compressive load was affected using diameter cylindrical plunger (0.8 mm) at a constant speed of 0.5 mm/min until the post was dislodged. The plunger was positioned in the center of each specimen. Bond strength values were measured by the amount of maximum force required to dislodge the post (N) by area (A). The statistical analysis was performed using the Analysis of Variance (ANOVA). Three readings were evaluated according to position of slice (cervical, middle and apical). The multiple comparisons were performed using the Tukey HSD test (Figures 1-3). Figure 1: Showed the bond strength for all groups in apical portion. 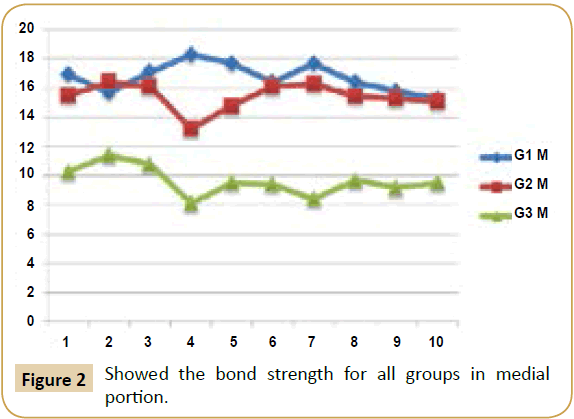 Figure 2: Showed the bond strength for all groups in medial portion. 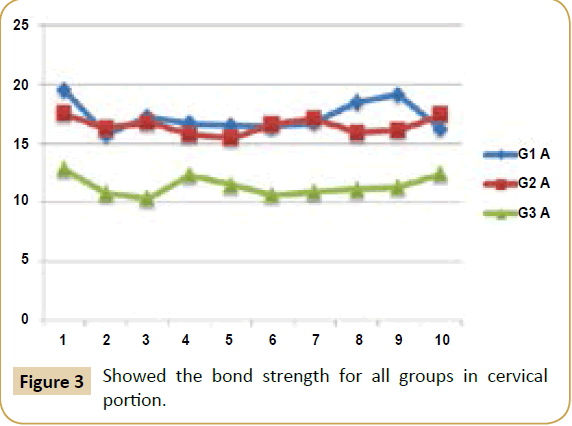 Figure 3: Showed the bond strength for all groups in cervical portion. The two-way ANOVA shown that there is significant change in the cement variable affected the push-out bond strength values (P<0.005). The post level, in turn, did not influence the bond strength of fiber posts to root dentin (P=0.148). The highest Bonding strength was shown in G2 cervical level, while the lowest was shown in G3 in middle level. It was evaluated that the highest bond strength was shown in cervical level in all cement types, while the lowest was shown in the middle level for all tested samples (Table 2). Table 2: Illustrate the mean of bond strength and SD for each specimen. Different types of cement have different adhesion strength and different protocol. G3, G1 and G2 are contemporary different in setting reactions. Fluoride ions that are released from polyacrylic acid during setting reaction to form cross links with dentinal wall; in addition, setting reaction is moisture and time dependent . While G1 and G2, their setting reaction is by micromechanical bonding. The monomer is set to form hybrid layers that penetrate the collagen fiber and form bonding between dentine surface and cement . The cement has a very low pH, allowing the hydrophilic properties of the material to provide a good adaptation to the root walls. In the course of the reaction, acidic monomers interact with the filler components of the cement and the hydroxyapatite content in dentin, neutralizing the reaction and increasing. Studies were shown that bond strengths of endodontic posts and root canal dentine are affected according to different types of cement . Others showed that the conditioning of dentine is effective in the enhancement of the bond strength of cements to dentin [19,23]. The region of the root canal significantly affects the interface strength with the highest values for the coronal third and lowest for the middle and apical thirds . Ferrari et al. reported that there was direct relation between bonding strength and dentinal tubule, which explained the higher adhesion strength, was shown in the coronal part than apical or middle part of root canal dentine. Cardoso et al. showed decreases in the bond strength of G1 to dentin if they did not use cavity conditioners. In this study the highest bonding strength was observed in RelyX U200 cement, while the lowest significant change was observed with Lining Cement G3. Resin cements may need to improve in the apical portion in the portion that is difficult for complete dryness from dentinal fluid and modifying of smear layer . According to limitation of this study, types of light cure device and different procedure of resin cement that was used may affect to the result of this study. We concluded that types of cement have significant differences in bonding strength of the fiber optic post to root dentine. The higher bonding strength was observed in Unicem U 200 while the lowest was seen in Conventional G3. G1 has higher bonding strength than Conventional G1 due to micromechanical retention. Santos-Filho PCF, Verissimo C, Queiroz CL, Saltarelo RC, Soares CJ, et al. (2013) The effect of type post, crown, and ferrule presence on stress distribution of maxillary central incisors with weakened roots: Finite Element Analysis. 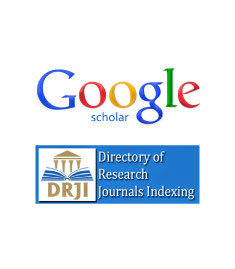 JRes Dent 1: 154-164. Bitter K, Noetzel J, Stamm O, Vaudt J, Meyer-Lueckel H, et al. (2009) Randomized clinical trial comparing the effects of post placement on failure rate of postendodontic restorations: preliminary results of a mean period of 32 months. J Endod 35: 1477-1482. Mazzitelli C, Ferrari M, Toledano M, Osorio E, Monticelli F, et al. (2008) Surface roughness analysis of fiber post conditioning processes. J Dent Res 87: 186-190. Santos AF, Meira JB, Tanaka CB, Xavier TA, Ballester RY, et al. (2010) Can fiber posts increase root stresses and reduce fracture? J Dent Res 89: 587-591. Cury AH, Goracci C, Navarro MF, Carvalho RM, Sadek FT, et al. (2006) Effect of hygroscopic expansion on the push-out resistance of glass ionomer-based cements used for the luting of glass fiber posts. J Endod 32: 537-540. Valandro LF, Baldissara P, Galhano GA, Melo RM, Mallmann A, et al. (2007) Effect of mechanical cycling on the push-out bond strength of fiber posts adhesively bonded to human root dentin. Oper Dent 32: 579-588. Bouillaguet S, Troesch S, Krejci I, Pashley D, Meyer J (2003) Microtensile Bond strength between adhesive cements and root canal dentin. J Dent Res19:199-205. Reis KR, Spyrides GM, Oliveira JA, Jnoub AA, Dias KR, et al. (2011) Effect of cement type and water storage time on the push-out bond strength of a glass fiber post. Braz Dent J 22: 359-364. Kulunk S, Kulunk T, Yenisey M (2012) Effects of different surface pre-treatments on the bond strength of adhesive resin cement to quartz fiber post. Acta Odontol Scand 70: 547-554. Shiratori FK, Valle AL, Pegoraro TA, Carvalho RM, Pereira JR (2013) Influence of technique and manipulation on self-adhesive resin cements used to cement intraradicular posts. J Prosthet Dent 110: 56-60. Ferrari M, Carvalho C, Goracci C, Antoniolli F, Mazzoni A, et al. (2009) Influence of luting material filler content on post cementation. JDent Res 88: 951-956. Bottino MA, Baldissara P, Valandro LF, Galhano GA, Scotti R (2007) Effects of mechanical cycling on the bonding of zirconia and fiber posts to human root dentin. J Adhes Dent 9: 327-331. Sahafi A, Peutzfeldt A, Ravnholt G, Asmussen E, Gotfredsen K (2005) Resistance to cyclic loading of teeth restored with posts. Clin Oral Investig 9: 84-90. Wiskott HW, Nicholls JI, Belser UC (1995) Stress fatigue: basic principles and prosthodontic implications. Int J Prosthodont 8: 105-116. Grandini S, Chieffi N, Cagidiaco MC, Goracci C, Ferrari M (2008) Fatigue resistance and structural integrity of different types of fiber posts. Dent Mater J 27: 687-694. Hayashi M, Sugeta A, Takahashi Y, Imazato S, Ebisu S (2008) Static and fatigue fracture resistances of pulpless teeth restored with post-cores. Dent Mater 24: 1178-1186. Cardoso MV, Delme KI, Mine A, Neves Ade A, Coutinho E, et al. (2010) Towards a better understanding of the adhesion mechanism of resin-modified glass-ionomers by bonding to differently prepared dentin. J Dent38: 921-929. Pereira JR, Lins do Valle A, Ghizoni JS, Lorenzoni FC, Ramos MB, et al. (2013) Push-out bond strengths of different dental cements used to cement glass fiber posts. J Prosthet Dent 110: 134-140. Pereira P, Yamada T, Inokoshi S, Burrow M, Sano H, et al. (1998) Adhesion of resin-modified glass ionomer cements using resin bonding systems. J Dent 26: 479-485. Marquezan M, Fagundes TC, Toledano M, Navarro MF, Osorio R (2009) Differential bonds degradation of two resin-modified glass-ionomer cements in primary and permanent teeth. J Dent 37: 857-864. Khoroushi M, Karvandi TM, Sadeghi R (2012) Effect of prewarming and/or delayed light activation on resin-modified glass ionomer bond strength to tooth structures. Oper Dent 37: 54-62. Keefe KL, Miller BH, Powers JM (2000) In vitro tensile bond strength of adhesive cements to new post materials. Int J Prosthodont 13: 47-51. Pereira PN, Yamada T, Tei R, Tagami J (1997) Bond strength and interface micromorphology of an improved resin-modified glass ionomer cement. Am J Dent 10: 128-132. Mallmann A, Jacques LB, Valandro LF, Mathias P, Muench A (2005) Microtensile bond strength of light- and self-cured adhesive systems to intraradicular dentin using a translucent fiber post. Oper Dent 30: 500-506. Ferrari M, Mannocci F, Vichi A, Cagidiaco MC, Mjor IA (2000) Bonding to root canal: structural characteristics of the substrate. Am J Dent 13: 255-260.